If you follow us on twitter (and if you don’t, you should), you may know that I’ve been making a lot of ice cream lately, using fruits, vegetables, and herbs from my local Greenmarket. On my way to meet Jess & Garrett at 900 Degrees I passed by Victory Garden, an ice cream shop that offers lots of local, seasonal flavors. I made up my mind to stop by after pizza, because, you know… research. Thankfully Jess & Garrett decided to come with me. Of course I am almost always attracted to the most unusual flavors I can find, so instead of ordering the black currant or the chocolate rosemary, I decided on the mastic flavor. Mastic, as I’m sure you know, is the resin of a tree from a small Greek island, and has a pine-like flavor. 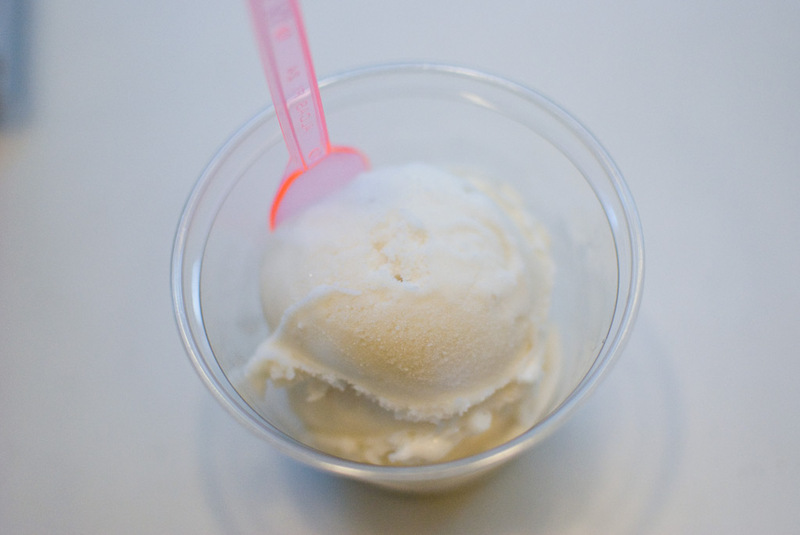 Victory Garden was offering this unusual flavor in a Turkish-style ice cream called salep, or dondurma. Salep, and again I’m sure you’re aware of this, is made from the root of an orchid, and makes the ice cream stretchy and chewy. The server described the texture as similar to mozzarella cheese, which is close. I’d also say it was similar to marshmallow. So yeah, I ended up eating chewy, pine flavored ice cream. It was good, and I’m glad I ordered it, but I don’t think I’d get it again. You should get some and decide for yourself.